The bicentenary of the battle of Waterloo, fought on 18 June 1815, affords the ideal opportunity to promote one of our recent acquisitions: the manuscript journal of a cavalryman in the Scots Greys (now the Royal Scots Dragoon Guards), who fought in the decisive battle which finally ended the dominance of Napoleon Bonaparte in Europe. Scotland Forever! Lady Elizabeth Butler’s dramatic (if implausible) depiction of the Scots Greys’ famous charge at Waterloo. Wikimedia image. The journal is of great value to researchers, as it provides a detailed description of a soldier’s life during the period of the Napoleonic Wars, and includes a lengthy and graphic account of the battle and its aftermath. It covers the years from c.1799 until 1825, when the author finally left military service. The anonymous autobiographical account is handwritten in a bound journal, compiled at an unspecified date. The soldier’s identity is suggested only by what are presumed to be his initials, ‘W. C.’, revealed in a recollected conversation in the text as he is recognized by a dying comrade after the battle; he may be William Clarke, a sergeant in the Scots Greys, listed in the regiment’s Waterloo roll call. The writer was born at an unknown location in Perthshire, probably around the mid-1780s, later moving to Alva House at the foot of the Ochil Hills. He recalls leaving home about the age of 14 to work for a farmer near Dunfermline, and the first part of the journal is occupied with his peripatetic lifestyle as he travels around Scotland, working variously as a farm-hand and gardener. When a detachment of the Greys visits Ayr, he decides to enlist. There follows a description of his training in Canterbury, his initial duties on the south coast, and the regiment’s subsequent itinerary around Britain. He describes pursuing smugglers and illegal distillers in Ireland, and he records being stationed in Manchester in May 1812, during the Luddite disturbances, although he does not elaborate on the experience. Opening of the journal, showing sketches of the ‘squares’ – the British troops’ defensive formations. The diary also contains an account of the coronation of King George IV in July 1821, to which the Greys were summoned. The royal visit to Edinburgh in August 1822, the first visit of a reigning British monarch to Scotland for over 170 years, is particularly detailed, as he describes the preparations, celebrations and itinerary over the two-week event. At one point, the writer digresses at length as he relates the story of his friend, whom he encountered amongst ‘gypsies’ in Essex during the early days of his soldier’s career. Wentworth, as he is known, had enjoyed a lengthy and colourful life, which featured a shipwreck whilst fleeing to America in 1754, temporary refuge with Indians, and capture by the French at sea en route home. Wentworth finally enlisted in the British army and fought in the Seven Years’ War in Europe, and his narrative includes detailed descriptions of battles during the campaign, particularly the battle of Minden in 1759. 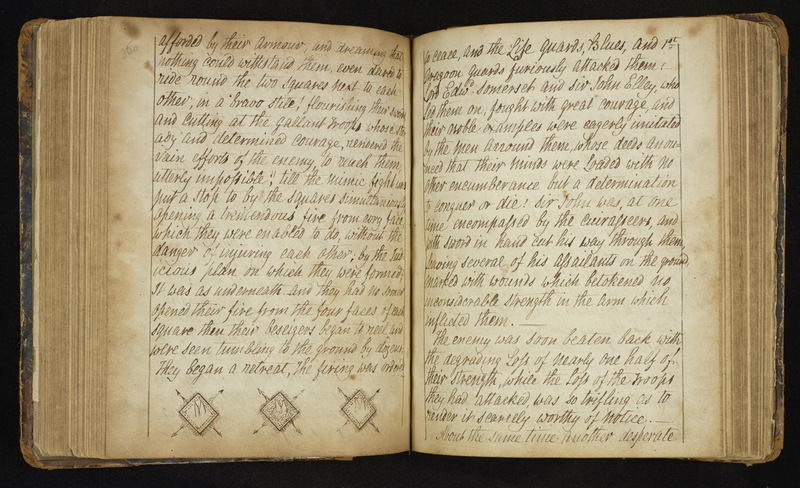 The journal, handed down through the generations, was purchased from a local family via an antiquarian bookseller in 2014. A detailed description of the diary is available on ELGAR. Reblogged this on The Annual Band Supper.